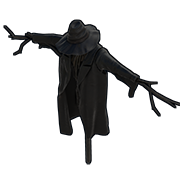 The Scarecrow item was added as a unique item store purchase during the 2017 Halloween event alongside other unique skins and items. The Scarecrow has no use in-game but can be placed down on the terrain. Scares crows, attracts pesky newmans. To counter this, place a Flame Turret.